I'm trying to get rid of stuff. My New Year's resolution for the last few years has been to give away or sell things I don't use. So, of course, my mother thinks this would be a good idea for her as well. Guess what happens? I "inherit" a boatload of new stuff. This is how I got my piano a few years ago. But a piano is not much fun if you don't have any music, right? So my mother is cleaning out her cabinets and I end up with about three large boxes of sheet music and songbooks. I'm not complaining, though- there's loads of good stuff in there. All Tin Pan Alley stuff from the teens and 20s, 1930s movie songs, show tunes, you name it- I probably now have it. But I had to go through all of it, piece by piece and separate out the good stuff from the things I will never, ever, play. There were some oddball things in there as well, like 45s from when I was a child. 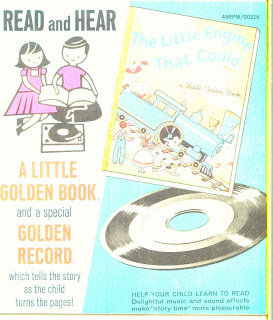 One of them was a Little Golden Book with a read-along record, The Little Engine that Could (c.1956). On the back it says: "Both parents and children alike will take to these ingenious gift sets...Parents will now be able to let the phonograph take over the job of reading 'just one more.'" And I took it one step farther, even: I loaded the record into the jukebox so I don't have to flip it over. All I have to do is push K5 and K6 and the jukebox reads the story. Now, if only the jukebox could give them their baths, we'd be in business. I have faith in you, Susie. If anyone can convince the jukebox to give baths, it's you!